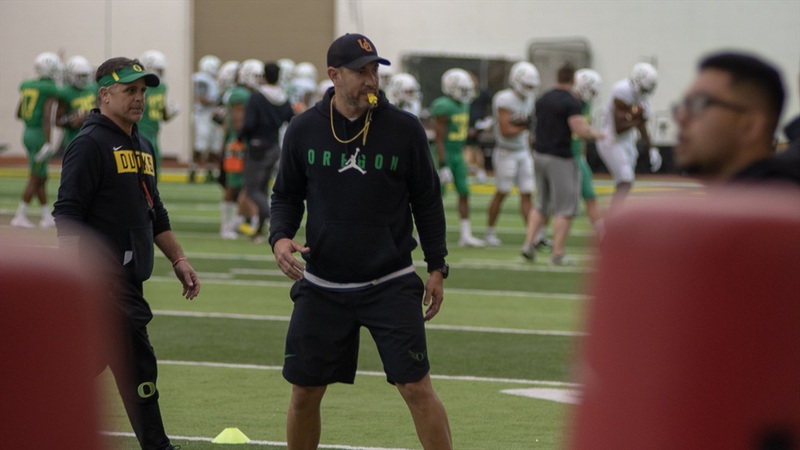 The Ducks didn’t let the rainy Eugene weather stop them from getting in a solid practice Thursday as they met in the Moshofsky Center for the second practice of spring quarter and the seventh overall this year. The most notable update is that Penn State grad transfer Juwan Johnson was in full pads and wearing No. 6. Listed at 6-4 and 229 pounds, Johnson is by far the most physically imposing wide receiver Oregon has on the roster. Brenden Schooler is listed at 6-2 but weighs in at 193, and both Isaah Crocker and JJ Tucker are listed at 6-1 and weigh 176 and 182, respectively. Not only is Johnson big, he is fast. Thursday's practice saw him getting in some impressive reps in with the first and second teams. Oregon’s first string for the day: Brady Aiello, Dallas Warmack, Jake Hanson, Shane Lemieux and Penei Sewell on the line (right to left), with Justin Herbert and Cyrus Habibi-Likio in the backfield and Brenden Schooler, Johnny Johnson III and Ryan Bay on the wings. After being limited in practice on Tuesday, safety Jevon Holland returned to full-go. And a couple of recruits also watched the practice, including 4-star LB Noah Sewell.